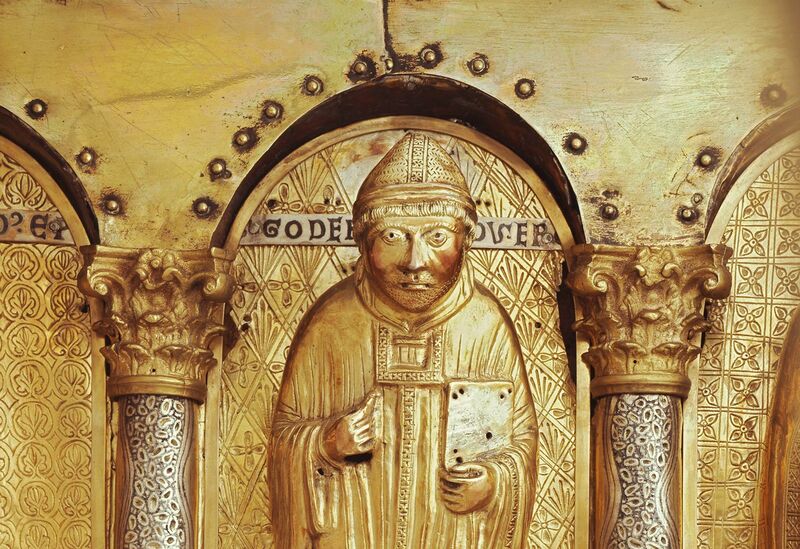 The Gotthard shrine is one of the oldest remaining relic shrines of the Middle Ages. The Gotthard shrine came into being circa1140. The Gotthard shrine is designed like a beautiful palace. Its oak core is covered in gilted silver plates and decorated with figures and jewels. The interior contains the remains of the holy Gotthard, who, as Bernward’s successor, was the Bishop of Hildesheim from 1022 to 1038. The shrine is in the Cathedral crypt over his grave. On the long sides, there are twelve figures of the apostles that are fully carved. The front sides show Christ between Mary and John the Baptist and, on the other side, the holy Gotthard, flanked by Bishop Bernhard and another bishop who has not yet been identified. However, the previously unidentified cleric to Gotthard’s left could be Hermann of Thuringia, to whom the cult of Gotthard in the Cathedral demonstrably owes its impetus. The shrine was opened in 2009 in order to remove the relics and investigate them. The precious materials that enveloped the relics were restored in the Abbegstiftung (Switzerland). The shrine was analysed and documented from a material, technical and historical perspective. The investigations carried out using the latest technical procedures shed light on the condition of the shrine and served as the basis for its restoration.